Burlappcar: 2018 Chevrolet Cruze diesel to get 50MPG ? Automotive News claims the upcoming diesel version of the Cruze Hartchback could be one of the only non-hybrid cars in the US to reach 50MPG. It will have an all new 1.6 Liter engine. With a 6 speed manual. But the other big news is the availability of a new 9 speed auto! I mean, Diesel and 9 speed. Of course it'll get 50MPG. Over the years, I test drove a few VWs with the "now banned" 2.0 Liter Diesel. All rated at 42MPG Hwy. No matter which car. Golf, Jetta even the larger Passat. All officially rated at 42MPG. Of course, now we now these amazing figures were achieved at the cost of pollution. But, not knowing about the "cheat", I was amazed. It looks like GM has been making a few gutsy moves lately. Mostly by offering a bunch of diesel options. Colorado Pick Up, new 2018 Equinox. And now the Cruze hatchback. It's pretty amazing what Chevy can do with a U.S. taxpayer bailout and GM Europe's engine design. The problem is that the bottom-line difference between 42 MPG and 50 MPG is around $10/month for the average driver. Hardly worth the hassle if you don't have a 100 mile commute. Base gas version STARTS at $22,190 (plus delivery, I believe) so the Cruze hatch will absolutely fail. I say that sadly - I like it quite a bit but there is no way that should base at 22 to 23k. Add a diesel and you have a base at 25 to 26k, and then add a few goodies and the diesel hatch is 30k. Forget it. Chevy will need to have blow out sales to get anyone to buy with an MSRP like that. 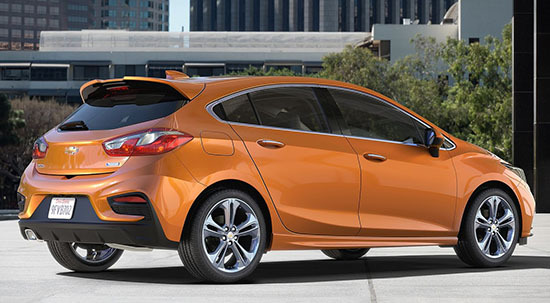 There is no "base" version of the Cruze hatchback. It starts with the LT model. The sedan is cheaper because there are cheaper L and LS models. An LT manual sedan is about $21 100. So the premium fort the hatch is only about $1000. Ford Focus SE (again, no base model in the hatchback) starts at $19,015. The Civic HB starts at $19,700... Paying $2K to $3K MORE for a Chevy??? No thanks. Interesting. They've made a home for Golf and Jetta TDI customers!